The Contemporary Art Society of Vancouver and AgentC Projects invite you to visit Chun Hua Catherine Dong at Island Studio, where she will talk about her work and ask interested visitors to participate in field research for her ongoing project, The Arrival. The Arrival is a participatory, research-based performance that examines identity, place, and belonging through languages and gestures. In her field research Dong records random “Where are you from?” with different tones and emotions. She also invites people who she cannot meet in person to participate by recording their own voices and sending their recordings to her. 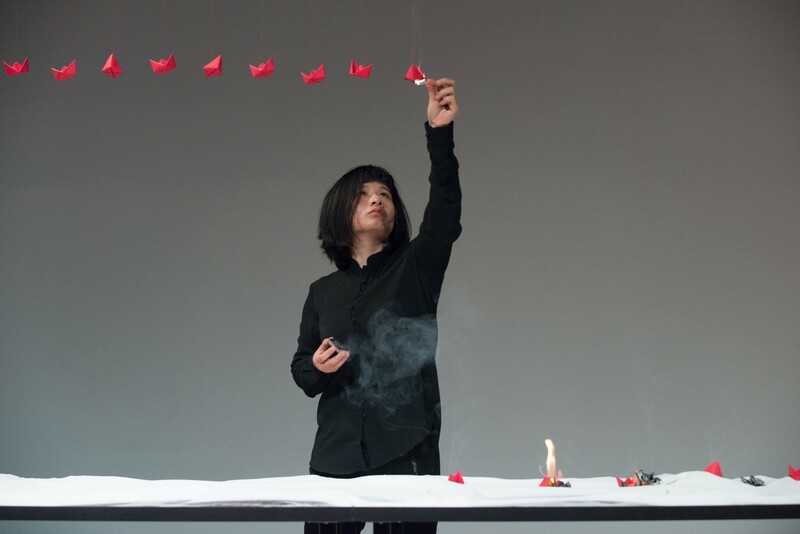 Dong’s performance component of this work incorporates these recordings, salt, and paper boats as a response to her research. Chun Hua Catherine Dong is a Chinese born Montreal based visual artist working with performance, photography, and video. She received a MFA from Concordia University and a BFA from Emily Carr University Art & Design. Dong has performed in multiple international performance art festivals and venues, such as, The Great American Performance Art in New York, Rapid Pulse International Performance Art Festival in Chicago, Infr’Action in Venice, Quebec City Biennial, Kaunas Biennial in Lithuania, The Musée d’Art Contemporain du Val-de-Marne in France, The Aine Art Museum in Tornio. Her video work has been screened in Brazil, Mexico, Finland, Germany, Italy, Ireland, Colombia, Spain, The Netherlands, Finland, Poland, Greece, Romania, Croatia, Denmark, Sweden, Scotland, China, USA, and Canada. Among many other awards and grants, Dong is the recipient of the Franklin Furnace Award for contemporary avant-garde art in New York in 2014. She is listed as one of the “10 Artists ho Are Reinventing History” by Canadian Art Magazine in 2017 and ‘‘Top Nine Political Art Projects of 2010’’ by Art and Threat magazine. AgentC Projects, in partnership with the Surrey Art Gallery, is also pleased to invite you to Surrey Art Gallery’s Spring Opening where Chun Hua Catherine Dong will perform her new work, The Undocumented.